Activities at Lawrence Park Tennis Club include tennis events for every level of play, along with many programs designed to encourage social interaction and fun. Some programs are for those who want competitive play while others are for those who prefer a more relaxed, recreational experience. Early Birds is a popular and a great way to meet other members and play some doubles in a round robin format. Members at all levels are welcome to play Monday to Friday from 8am – 10am (8 am – 9:30 on Mondays) on all 3 courts with no registration needed. Come when you can, and play for as long as you can. Players change over after every four games. Please note that there will be no Early Bird program on statutory holidays. Play is organized by one of our member volunteers. Please contact our Games Director (Games@LawrenceParkTennisClub.ca) if you have questions. On Wednesday evenings starting in June, members are encouraged to come down to the Club after dinner (starting at 7pm) to pick up a game with other members… A great way to get a few social games in and perhaps find a hitting partner. All members welcome. We have league teams for those who enjoy competitive tennis, daytime ladies’ teams and inter-county teams, for players at the intermediate level and above. Members interested in trying out for these teams should watch for more information in our member newsletter, Between the Lines, and may click here for more details. House League is a very popular organized doubles activity for all members at all levels. House League will run from the middle of May every Monday night from 7pm to 10pm (depending on the level of interest). For more information, click here and watch for details in our member newsletter, Between the Lines. Our singles ladder brings together players who wish to play singles competitively through the summer. The sign-up will take place early in the season and the rankings are re-issued once a week through the summer. Members are encouraged to watch our Between the Lines newsletter for details. 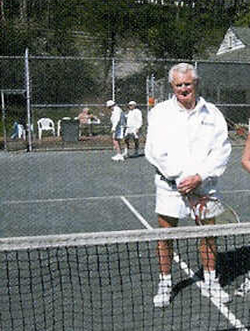 Club tournaments are held in September in singles, doubles, and mixed doubles by Level (A, B, and C). Players must register to enter and information on registration is sent out through our member newsletter, Between the Lines. Click here for more information. Organized play programs for Juniors are organised based on demand (and available parent volunteers!) over the course of the season. Picture a Junior points race, a junior challenge ladder, or a junior house league – any parents with energy and ideas should contact our Junior Program Director at juniorprograms@lawrenceparktennisclub.ca.